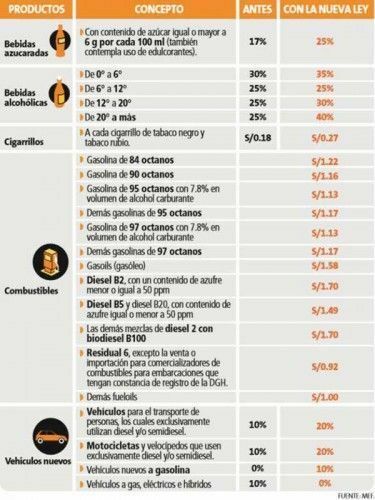 Peruvian government raises taxes on sodas, alcoholic beverages, cigarettes, fuels and polluting cars. Almost unnoticed by the public that seems to suffer from a severe outbreak of soccer fever due to Peru’s participation in the World Cup in Russia, last week the Peruvian government presented a new law in which excise taxes on sodas, alcoholic beverages, cigarettes, fuels and new cars powered by diesel or gasoline are significantly raised. Over the past years dietary changes and environmental pollution created a number of before nearly unknown public health problems in Peru and contributed to an extreme rise of non-communicable diseases associated with overweight / obesity, drinking, smoking and pollution in the country. According to the Peruvian Finance Ministry addressing this public health crisis costs the Peruvian taxpayer yearly about US$ 24 billion, about 11% of the GDP, while spending on health care amounts to only 3.7% of the GDP. So, in an attempt to reduce the consumption of drinks with a high amount of added sugar, of alcoholic beverages and cigarettes (or as evil tongues would say to get a piece of the rising unhealthy consumer habits cake) taxes on them are increased. Sodas are now taxed 25% instead of 17% before; depending on the alcohol content alcoholic beverages are taxed between 25% and 40%, and smokers now have to pay S/ 0.27 tax per cigarette instead of S/ 0.18. Additionally, fuels see a tax between S/ 1.13 und S/ 1.22 per liter for the different types of gasoline and S/ 1.49 or S/ 1.70 for diesel. New cars powered by gasoline before were tax free, but now face a 10% tax, while those running on gas, electricity or other cleaner options before were taxed 10% and now are tax free. The tax for diesel cars increased from 10% to 20%.